(25 Nov 1881 – 3 June 1963). Angelo Giuseppe Roncalli was born on 25 Nov. 1881, third child of thirteen children, in a family of frugal peasant farmers, from a small village near Bergamo, Italy. After attending the village school and the two seminaries in Bergamo, he went with a scholarship to Rome in 1901, graduating doctor of theology in 1904. He became secretary to the local bishop and also lectured in church history at the Bergamo seminary. Conscripted in the First World War, he served first as a hospital orderly, then as a chaplain. As a young man Angelo Roncalli took the process of ‘spiritual formation very seriously’. He instituted a self discipline; he began a lifelong journal (Journal of a Soul) in which he inter-weaved quotations of important passages from the Bible and other impeccable sources; lists of resolutions, moments of insight or grace, records of trivial faults or momentary backslidings, and direct expressions of love to Jesus and the Blessed Virgin. He was chronicling what was in his mind, and developing a habit that was to last a lifetime. In the journal a glimpse is offered of a serious young adolescent making himself – constructing himself – into an individual that he could himself respect, in the way that great religious leaders, saints or ordinary devout individuals could command respect. To readers unaccustomed to someone fully fixed on his spiritual growth, Roncalli’s Journal of a Soul can appear a boring, even lifeless record. It is tedious to read lists of behaviours to be carried out every day (“Meditate for at least a quarter of an hour,” “Read some passage from the devout Thomas a Kempis in Latin”), every week (“Be diligent in attending the meetings of the Sodality and the study circles,” “Fast on Fridays and Saturdays in honour of the Passion of Jesus Christ and of our Lady”), every month (“Read these little Rules several times, and it will be well to do this in the company of others, so as to check your observance of them”), every year (“Before leaving the seminary for the holidays, confer with your spiritual director about how best to spend them well in the Lord”), and all the time (“Have a special love for your companions and this mutual love must come from God and tend to God”; “No one shall lay his hands on another,” “Do not use the intimate ‘tu’ when speaking with one another and do not use dialect words or, worse, immodest expressions; if you hear these used by others, go away, showing that you will not take part in such conversations,” “Evil companions must be shunned like vipers,” “No books must be read that have the slightest taint of immodesty,” ” Do not attend public spectacles”). The age span 16-30 is crucial, for, that is the period when life adds sweetness to itself, when talents, skills, and attitudes are accumulated, sublimated and sanctified. If the tonic of unselfish service is administered to the mind during this period, life’s mission is fulfilled&emdash;for, the process of sublimation and sanctification will be hastened by this tonic. Do not serve for the sake of reward, attracting attention, or earning gratitude, or from a sense of pride at your own superiority in skill, wealth, status or authority. Serve, because you are urged by Love. When you succeed, ascribe the success to the Grace of God, who urged you on, as Love within you. When you fail, ascribe the failure to your own inadequacy, insincerity or ignorance. Examine the springs of action, disinfect them from all trace of ego. Do not throw the blame on the recipients of the selfless service, or on your collaborators and co-workers, or on God. Father Roncalli made a decades long study of St Charles Borromeo. This was his chosen patron saint. Eventually he was to publish 5 volumes of his study immediately prior to his election as Pope. Borromeo was a strong, reforming Bishop of Milan in the sixteenth century. 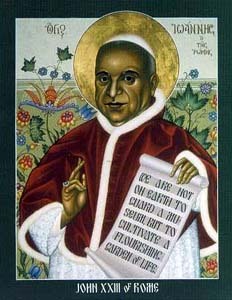 Borromeo petitioned his Pope to remain in his diocese. He became involved in the Usury dispute and gathered all his priests into synods regularly and advised them. He frequently petitioned the Pope to give the whole Church direction on the usury matter. He broke with the opinions and traditions of other bishops and introduced innovations into his diocese. Borromeo was to set the example for his priests and seminarians to follow; his seminary in Milan became the model of all European seminaries. Seminarians were to undertake a regular course of studies, set aside a period daily for mental prayer and make examination of conscience daily. He was a most effective preacher, preparing his sermons after much meditation and preaching extempore (without notes) In them he encouraged the practice of prayer. The church views Borromeo as still influential throughout Europe and he still remains the model of a good pastoral bishop. This personal study and ascesis (spiritual discipline) of the young Father Roncalli was to lay down an imitable model and discipline for himself to follow as a priest, an administrator, a Bishop, an international diplomat, a Cardinal, a Pope. In 1921 Father Roncalli was made director of an organisation in support of missions. In his spare time he wrote monographs on St Charles Borromeo. During his researches in the Ambrosian Library of Milan, he was to come into contact with Father Achille Ratti, the future Pope Pius XI. It was Pius XI who launched him on a diplomatic career, appointing him archbishop, Vatican diplomatic representative to Bulgaria in March 1925, and Vatican diplomatic representative to Turkey and Greece in 1934. Busy but lonely in the former post, he enjoyed the latter, establishing friendly relations with members of the Turkish government and leaders of the Orthodox churches. Appointed Papal Nuncio (Vatican Diplomat) to France on 22 Dec. 1944, he dealt tactfully but firmly with the problem of bishops accused by Charles de Gaulle of collaborating with the Vichy regime (Nazi collaborators), negotiated with the government over the financing of church and arranged for German prisoners-of-war who were training for the priesthood to follow courses in theology at Chartres. From 1952 Archbishop Roncalli was permanent observer for the Holy See at UNESCO. On 12th January 1953, he was named Cardinal, and Patriarch of Venice, where he was noted for his pastoral zeal, informality, and firm resistance to communist manoeuvres. In 1958 he completed the fifth and last volume of his studies on St Charles Borromeo. At the conclave of 25-28 Oct. 1958 he was elected at the twelfth ballot; he was consecrated Pope John the Twenty-Third on the 4th of November, the feast of his beloved patron saint, St. Charles Borromeo. When asked upon his election as Pope, what name he wished to be known by, he said he would be John. The cardinals were at first startled because the previous Pope John had been an antipope (a false claimant to the throne) during the Great Western Schism in the early fifteenth century. He explained, however, that John was his father’s name and that of the Catholic Church where he had been baptised. He also pointed out, with characteristic humour, that not only was the name most frequently used by popes throughout history, but that nearly all the Popes called John had brief pontificates. 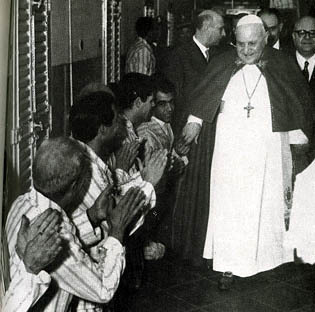 Typically, at Christmas 1958 he revived the custom, which had lapsed in 1870, of visiting the Regina Coeli prison and one of the local hospitals for children suffering from polio, where he was greeted like a kindly grandfather (‘Viene qui, viene qui, Papa’) they shouted to him. The Pope waddled over to the children and embraced each of them. On he next day when he went to Regina Coeli prison, he told the prisoners, “You could not come to me, so I came to see you”. He had a world wide image of a kindly, affable grandfather. The great gift of Pope John XXIII to humanity, his outstanding achievement, however, was the Second Vatican Council, the calling of which he attributed to a sudden inspiration of the Holy Spirit. When he first announced his plan to a group of 17 Cardinals at the Basilica of St Paul’s Outside The Walls, in January 1959, he was met with a stony silence, what italians call figura di bronzo, or poker face. One commentator later wrote that the Pope may as well have been reading out his laundry list. Its objective, he later explained, was to be a new Pentecost, a means of regeneration for the church, bringing its teaching, discipline, and organisation up to date, and opening a way towards the reunion of the separated churches of east and west. He set up preparatory commissions and secretariats on 5 June 1960, and opened the council itself in St Peter’s on 11 Oct. 1962. Official observers from eighteen non-Roman churches were present by invitation, and in his opening address he urged the fathers to expound truth positively without relying on anathemas. It would be a council not to censure heretics and dissenters, but to promote human solidarity. On the 8 of December 1962, Pope John closed the first session, adjourning the council for nine months. Already diagnosed with terminal stomach cancer, he did not live to see its resumption. In his encyclical Mater et magistra (Mother and Teacher) Pope John talked of the need to have human values: When the relations of human society are expressed in terms of rights and duties, men become conscious of spiritual values, understand the meaning and significance of truth, justice, charity and freedom, and become deeply aware that they belong to this world of values. Moreover, when moved by such concerns, they are brought to a better knowledge of the true God, who is personal and transcendent, and thus they make the ties that bind them to God the solid foundation and supreme criterion of their lives, both of that life which they live interiorly in the depths of their own souls and of that in which they are united to other men in society. 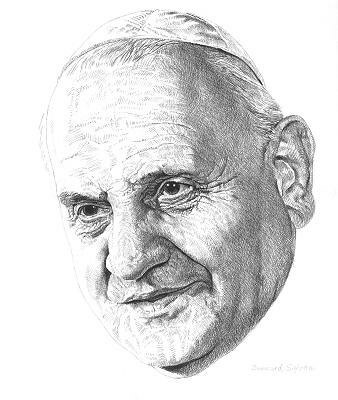 Two months before his death, Pope John stunned the world with his encyclical on peace, called Pacem in Terris, which, addressed to all mankind, set out the recognition of human rights and duties as the foundation of world peace and pressed for peaceful coexistence between the West and the communist East. This created a widespread impression, not least in the Soviet bloc, and led to his receiving Nikita Khrushchev’s daughter and son-in-law in the Spring of 1963. It also marked an important step in the inauguration by the Vatican of a more open eastern policy. During the Cuban missile crisis of 1962 John publicly urged both the USA and the USSR to exercise caution, winning the respect of Premier Khrushchev as well as of President John F. Kennedy. Next year the International Balzan Foundation awarded Pope John its Peace Prize. More than any pope, John wanted dialogue with the world, irrespective of creed. He advanced cooperation with other religions including Protestant, Greek Orthodox, Church of England, and even Shinto. His concern for Christian unity was expressed in his establishment in 1960 of the Secretariat for Christian Unity. He exchanged greetings with Patriarch Alexis of Moscow. He removed words offensive to Jews from the Good Friday liturgy, and on one occasion introduced himself to Jewish visitors with the words, “I am Joseph, your brother”. Warm-hearted and unaffectedly simple in spite of his erudition and command of many languages, attached to his humble origins and always retaining a peasant’s shrewdness and jovial humour, John brought a wind of change to his office, relaxing its legendary stiffness and, after decades of growing centralization, giving the Bishops of the Church a new role in governance. He identified and strongly affirmed three distinctive characteristics of the modern age: the growing recognition of the rights and dignity of workers, the growing participation of women in public life, and the growing interdependence of nations. What helps the human person grow, he insisted, is good. What stifles human growth, is bad. As he lay dying in his private Vatican apartments during late May and early June of 1963, many messages from persons who were ill with stomach cancer were sent to him from all around the world. When he died, he was proclaimed as the most beloved Pope in all of history. It was the media who labelled him, “Good Pope John”. 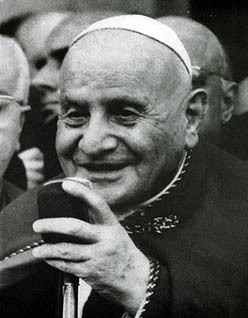 Pope John XXIII died in June of 1963. The cause for his being proclaimed a saint has been introduced. The process of beatification has been proceeding toward final canonisation and declaration of Saintliness. Pope John XXIII was beatified on Sunday 3 September 2000 amd proclaimed Blessed Pope John. More recently his tomb was opened and the coffin moved to the caves under the basilica of St Peters in Rome. This was for preparation to finally translate his tomb to a site close to the main altar in St Peter’s so that pilgrims may pray there. When they opened the coffin, bishops, medical staff and workmen were astonished to find the Pope’s face still intact. His body, clad in white robes, with red silk gloves and a velvet cap, also showed no signs of decay. Cardinal Virgillo, who is charge of St Peter’s Basilica told journalists: “It was as if he had died yesterday. The serenity he had in life he took with him in death and he still had it 38 years later”. It is understood by theologians that when the body of one who has been beatified is found intact, “It is a sign, an anticipation of the resurrection, and a confirmation of his or her saintliness. Such phenomenon is rare but not unheard of. 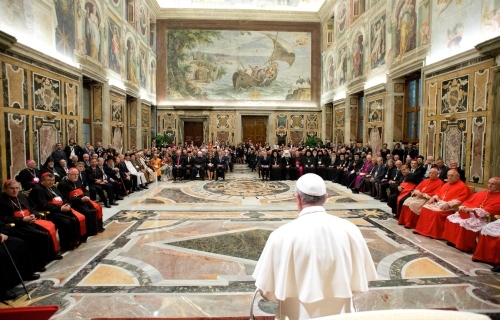 Sept. 30, 2013, by the Vatican newspaper L’Osservatore Romano, Pope Francis meets with representatives of different religions participating in an international meeting for peace, at the Vatican. Popes John Paul II and John XXIII will be declared saints on April 27 at a ceremony in Rome. 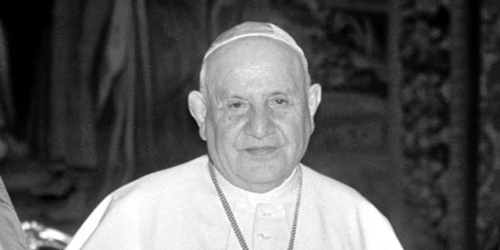 Pope John XXIII will be proclaimed a Saint of the Universal Church by Pope Francis on 27 April 2014. In living he sought and studied models to emulate, and kept personal disciplines that were to guide him though-out his life to the highest point in the priesthood, shepherd of the flock. As a shepherd he sought to steer the church away from condemnation to love and service of all mankind. He is universally known as Good Pope John. 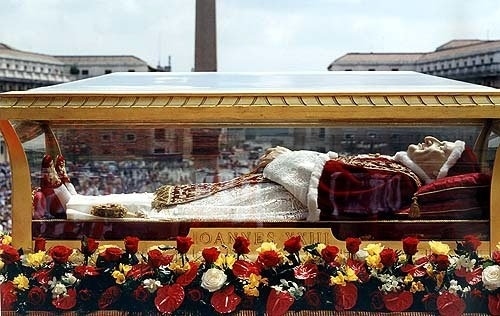 The date assigned for the liturgical celebration (where authorized) of Saint Pope John XXIII is not 3 June, the anniversary of his death, as would be usual, but 11 October, the anniversary of his opening of the Second Vatican Council. He is honoured by many Protestant communions as a Christian reformer. Both Anglican and Lutheran denominations commemorate John XXIII as a “renewer of the church“.